Veronica Druchniak spends her days studying math and physics. At night, she dances. 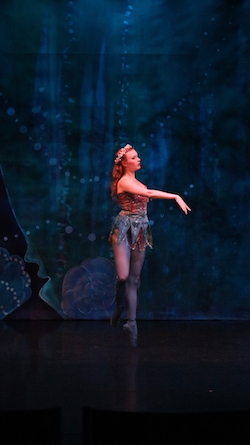 The 21-year-old math major from Standish serves as one of Maine State Ballet's principal dancers. And when the curtain rose Oct. 7 on ""The Little Mermaid," she was the title character. "I love this ballet," said Druchniak, who has managed to keep up with her responsibilities to both the production and the ballet company while maintaining her grades in rigorous courses. It's not all a fairy tale. There's been little time for friends, family or even sleep. "Given the choice between dancing and sleep, I choose 'dancing," she said. Her reluctance to make such choices is what led her to USM. "It was one of the best decisions I have ever made," Druchniak said. By coming to USM, she has been able to maintain her dancing and still earn her degree. She is scheduled to graduate in May 2018. "I am debt free and I am earning a quality education," she said. "I get to pursue all of my dreams." The discipline she learned from years on the ballet barre made her non-stop schedule doable, she said. Druchniak began dancing at 4 years old. "I would run around the house and dance on my toes," she said. Ballet seemed like a natural outlet. She loved it immediately. Her first role on stage was as a reindeer in "The Nutcracker." Her appearance in "The Little Mermaid" is a return for Druchniak, who first had the role in 2013. Today, she relishes being a role model for the little ones just entering the ballet. "I have been dancing my whole life," she said. "I came to love all the hard work." The school work hasn't been easy. At USM, she's had to miss some classes to make performances. Her professors have given her no short cuts, but they have worked to help her meet every requirement. And they support her when they can. "My advisor comes to every live production -- twice!" she said. After graduation, she plans to continue dancing. Eventually, she hopes to attend graduate school and return to the college classroom as a math professor. "That will be later," she said. "I have more dancing to do."